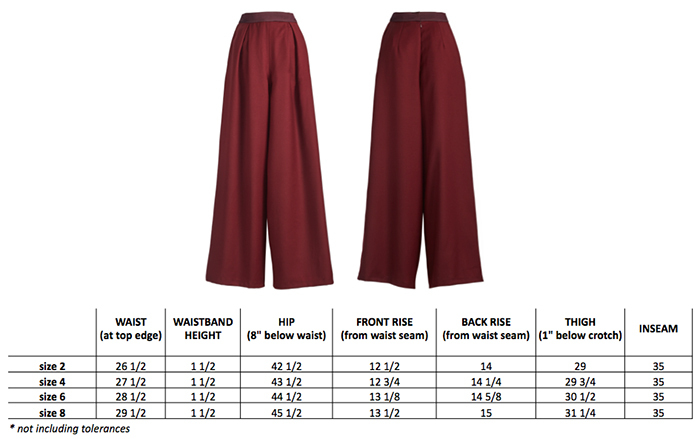 Full leg trouser in wine superfine Italian wool crepe with seam pockets and single inverted pleat. Fully lined, 35” inseam. Contrast waistband in silk wool. Heritage Sophistication. Hepburn & Dietrich. They made the women’s trouser a statement piece conveying both beauty and strength as women elevated into the professional workforce. Our City Trouser release is inspired by the style makers of the 1930’s yet designed for today’s woman who is strong, independent and confident. The City Trouser is a full leg trouser with a wide leg opening in superfine Italian wool crepe and features a contrast waistband in silk wool, seam pockets, fully lined and 35” inseam. The City Trouser is the perfect 3 season pant that offers chic versatility both on and off the clock.